As a part of World Animation Day celebration, Toonz Academy in association with Directorate of Higher Secondary Education, Kerala conducted SITAR 2017 – Animate – The Spirit of Animation camp in Technopark, Trivandrum from 23 to 27 October 2017. Toonz Academy team visited 14 districts of Kerala and conducted district level activities where in 1500 students from over 1400 schools participated. The best creative talents from all over Kerala were selected for the state camp. The five day camp was inaugurated by the honourable minister for education of the Government of Kerala, C. Raveendranath along with director in-charge of DHSE, Prakashan P.P, state coordinator for career guidance and adolescent counselling cell, Azeem CM. 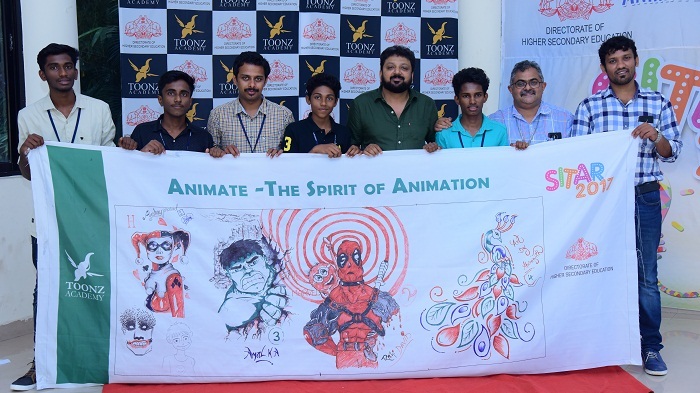 SITAR 2017 – Animate – “The Spirit of Animation” camp was a custom designed training program for animation and new media in and targeted at offering career guidance to students from the state of Kerala at the higher secondary level. Forty best creative talents from all the districts participated in this state camp. During this five day residential camp, the participants were engaged creatively by industry professionals and academy faculties through animation principles, introduction to visual effects and gaming wherein each of these students were engaged hands on by these experts. An exhibition of graffiti wall wherein creative arts of these 1500 students from all our Kerala was displayed during this week-long World Animation Day celebrations.